Presenting Domains of Freedom: 20 years after apartheid, are we perpetuating a lie? After 20 years of freedom in South Africa we have to ask ourselves difficult questions: are we willing to perpetuate a lie, search for facts or think wishfully? Freedom has been enabled by apartheid’s end, but at the same time some of apartheid’s key institutions and social relations are reproduced under the guise of “democracy”. 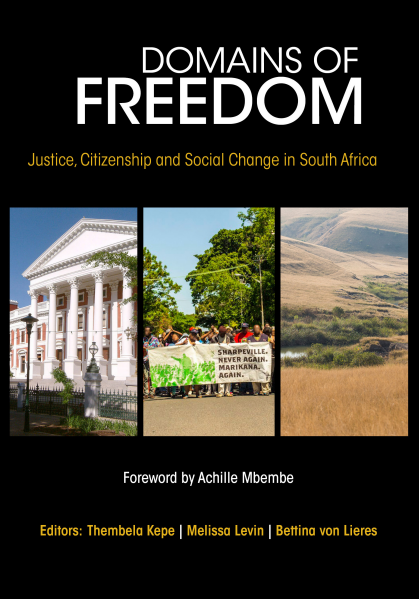 This collection acknowledges the enormous expectations placed on the shoulders of the South African revolution to produce an alternative political regime in response to apartheid and global neo-liberalism. It does not lament the inability of South Africa’s democracy to provide deeper freedoms, or suggest that since it hasn’t this is some form of betrayal. Freedom is made possible and/or limited by local political choices, contemporary global conditions and the complexities of social change. This book explores the multiplicity of spaces within which the dynamics of social change unfold, and the complex ways in which power is produced and reproduced. In this way, it seeks to understand the often non-linear practices through which alternative possibilities emerge, the lengthy and often indirect ways in which new communities are imagined and new solidarities are built. In this sense, this book is not a collection of hope or despair. Nor is it a book that seeks to situate itself between these two poles. Instead it aims to read the present historically, critically and politically, and to offer insights into the ongoing, iterative and often messy struggles for freedom. Thembela Kepe is an Associate Professor in the Department of Geography, and the Centre for Critical Development Studies at the University of Toronto, Canada. He is also a Visiting Professor in the Geography Department, Rhodes University, South Africa. Melissa Levin is a PhD student in Political Science and an instructor in African Studies at the University of Toronto. She has taught the politics of regional integration at Nelson Mandela Metropolitan University and African Literature at Khanya College. She was a trade union educator for the National Union of Mineworkers and a research and strategy director at the ANC where she edited Umrabulo for a number of years. Bettina von Lieres is a Lecturer in the Centre for Critical Development Studies at the University of Toronto, and she is Extraordinary Senior Researcher in the Political Studies Department at the University of the Western Cape, South Africa.